The seventh annual Lincoln School Valentine’s Ball February 9th was another wonderful and memorable evening with more than 350 attending. Pre-K through second grade girls and boys _ many dressed up in fancy, semi-formal attire and their Moms, Dads, siblings and other extended family members came to the fun-filled evening event. Lovely and well-planned again this year, the Valentine’s Ball centered around the decorated gymnasium and featured great music for dancing and colorful lighting effects by DJ Corey Comer. Throughout the evening, Comer played “The Cupig Shuffle” for everyone to dance to. All Lincoln students practiced the song and dance with Mary Lou Bonnell in her music classes. Stephanie Joyce’s Pre- Kindergarten pupils and Keara Foley’s second graders performed the dance on stage at the Farewell Friday assembly Feb. 8th and then invited everyone at the assembly to join them in doing The Cupig Shuffle.” Joyce said the whole focus of this is “spreading the love at Lincoln School” like in the book “The Cupig Shuffle” by Erin Canty. Kindness arrows, with compliments or kind messages on them, written by students and others, were also posted in the hallways for the Valentine’s Ball so everyone could read them. 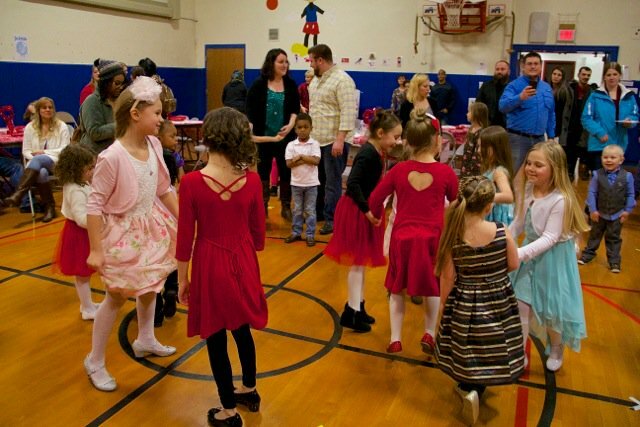 Each year the Valentine’s Ball features refreshments at the “Sweetheart Dinner,” in the cafeteria that includes pizza, milk or water and Valentine cookies that were made this year by Lori’s Truffles and Treats in Bloomfield. Wegmans donated water and cheese sticks. All of the refreshments were available free for everyone to enjoy. Again this year, there was the very, very popular family photo station arranged for by Joyce, who was a member of the PTA subcommittee that planned the Valentine’s Ball. Her husband, Karl, took photos along with Winston Vargas, a retired photographer. Again this year, the Joyce’s will donate a free 4×6 photo to those who were photographed. About 52 Newark High School, Newark Middle school students and Lincoln School staff volunteered at the event. Greg Herbst, Lincoln and Perkins School Assistant Principal, served as the volunteer coordinator. At the end of the evening, children were given a Valentine’s Day stamper with a wish attached to it. The cost of the entire event, minus the donations of milk from Willow Bend Farm in Clifton Springs, was entirely underwritten by the PTA. There was no cost to anyone attending for anything. Joyce thanked the Village of Newark for arranging to have lights on at the nearby skating rink to provide more illumination for people coming into the school; the NCSD Transportation Department for shuttle bus service to the school from Newark-Wayne Hospital for those who parked there and Newark-Wayne Hospital for providing coat racks and designated parking spaces for overflow parking.